Hamilton bed and breakfast travel guide for romantic, historic and adventure b&b's. 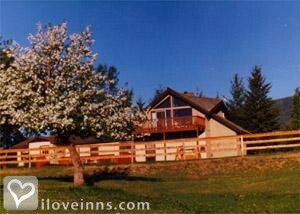 Browse through the iLoveInns.com database of Hamilton, Montana bed and breakfasts and country inns to find detailed listings that include room rates, special deals and area activities. You can click on the 'check rates and availability' button to contact the innkeeper. Hamilton, MT in Bitterroot Valley is home to rivers rich with aquatic resources, lush forests with a variety of flora and fauna, and rodeo. World class fly fishing is one activity Hamilton is proud of, especially at Bitterroot River. Trapper Peak, is ideal for hiking or nature-trekking. To mingle with the locals and witness festive rodeo events in Hamilton, the best times to visit is during Pow-wow or the Blue Grass Festival. For dinners, guests at Hamilton bed and breakfast inns can drive to the area's best restaurants, such as Bradley O's Homestead, The Spice of Life, The Grubstake, and Napolitani's. By Deer Crossing B&B.